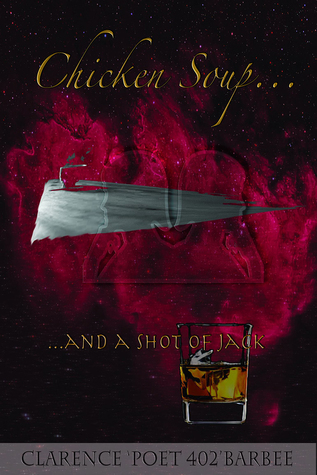 Chicken Soup and A Shot of Jack is the latest fresh work from young author Clarence Barbee. It is an strikingly impressive collection of emotion evoking essays, master class poems, and short stories that will have you laughing in the aisles. The writer weaves his form of prose, delighting readers with thought provoking lessons on how to balance the good and bad in life. What would the world be, without the under-dog; the long shot who seemingly lacks the essence for success? The one who everyone is able to get behind and root for, as it is darkest just before the dawn. Chief Bromden in the classic One Flew Over the Cuckoo’s Nest, the 1980 USA Men’s Hockey team, or even the Devil in Paradise Lost—the great dark horses who were able to rise up to the light of triumph. The great under-dog in this case is the untested writer, and his first work. In this age of astonishment and immediate gratification, some may feel that not enough of society takes the time to read, much less the time to write. However there are writers who wake up every day with that yearning, that pit in their gut telling them to get up and link words together; as thoughts become paragraphs and paragraphs become pages, and those pages add up to a book. It is the author’s pain staking effort, which creates a work of wonder. It is the untested writer, the dreamer who takes the chance. He makes the bet versus a million to one odds, with the faith that his words will reach out rise above the abyss and touch someone. It is Chief Bromden struggling to pull out the water fountain, then carries it on his shoulder to throw it magnificently through the window. It is the triumph of freedom, it is the risk taken, as others lay in their bed, proud of you, even if they are too scared to try. Chicken Soup and A Shot of Jack is that long shot. A collection of captivating essays from an untested author; a self-proclaimed poet with shelves empty of any awards or accomplishments. The one thing that the under-dog has is heart; it takes the criticism, the doubt, and the silence of a world that is unconcerned with its existence. This book takes all these things in stride. With honesty and grace, it challenges the critics, reassures the doubters, then begins an open conversation with the world. I am the type of writer who accepts the challenge; the kind who will take the chalice in hand, and go forth regardless of any handicaps. I am a believer in the human spirit, I see it fall down seven, then get back up for eight. These stories must be shared; they are unafraid and strong, like the will of a dying child to live. Chicken Soup and A Shot of Jack is the under dog, the challenger. Cheer for it, fight for it, get on the bandwagon and ride with it! They never taught us anything about why the Mayans believed there would be no life after 2012; they just said they were wrong. They never taught us about why the Muslims hate America, they just said the Muslims were terrorist, and they were responsible for 9/11. What is a Jihad, and does it have anything to do with The Crusade? Did Jesus make the crusades happen because Christians are truly violent people? They never taught us what the Pope does, or why the Dali Lama is named after an animal. Clarence Barbee has been writing and performing poetry for over a decade. He has produced 9 spoken word albums, under the pseudonyms Nabraska and Poet402. Clarence is now working on self-publishing books of essays and short stories. In his professional life he has worked with, educated, and supported many children. Clarence believes in keeping an eye on political planes and social occurrences such as changes in world leadership, and social inequalities. These actions of men are a huge curiosity to the author; he believes in writing about them, and discussing them, so solutions can be made. Clarence has taken these experiences and written about them extensively. He asks, “Who doesn’t want to be happy,” then goes about the business of finding the answer. Please take some time to join him on this journey as they are set through words, sometimes with music, and always taken with a grain of salt. Clarence will be awarding $10 Amazon or B/N GC to a randomly drawn winner via rafflecopter during the tour. Thank you so much, you did a great job with this!! Well thank you Clarence! How are you doing today?? I'm great, thank u again for the wonderful job!! U got the underdog up on his hind legs!! Let's hear it for the underdogs. A fun post thank you. thank u Mary!! I see u know something about being a underdog! Great post! LOVE the title! Thank you! Now this really caught my attention. And I agree with Betty...a wonderful title. This would be worth a thoughtful read. Thank u guys for all the great comments!! And don't forget to get the book!! "... Clarence Barbee has been writing and performing poetry for over a decade." Awesome!!! Thank you for the great comments!! I enjoyed reading the excerpt. I will totally have to add it to my "to-read" list.